European Roulette table above, American Roulette table below. 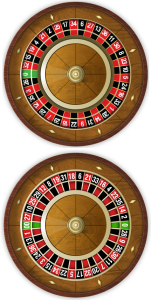 While roulette itself is a fairly simple game, it involves several different odds scenarios that you will have to memorize if you want to give yourself the best chance of winning. Fortunately, every possible bet in roulette adheres to a certain set of odds that applies across multiple options, making it easier for players, even novices, to have as much information at their fingertips as they will need. On an American-style roulette table, there are 38 different numbered pockets into which the ball can drop – numbers 1-36, zero and double zero. European-style tables only have the single zero. Ideally, you would play at a European table since having one fewer space does favor the player, but even in Europe, many casinos have switched to the American set up. Through the number ranges 1-10 and 19-28, odd numbers are red and even numbers are black. 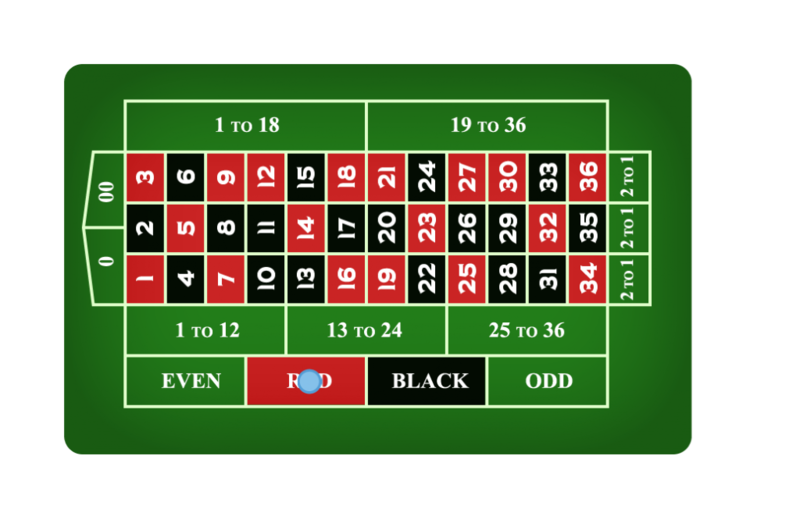 For the ranges 11-18 and 29-36, odd numbers are black and evens are red. Zero and double-zero are usually green. In roulette, there are two “areas” of betting – inside and outside. Both terms refer to the place on the table where the actual bet is laid down. Inside bets go directly on the numbered spaces located within the inner betting area. Outside bets are ones made on groupings of numbers, and the area where those bets are placed is on the outer edge of the betting area. Table with a Trio bet. Street: A bet on three numbers that lie on the same horizontal line. The chip is placed on the edge one of the numbers at either end of the row (which end depends on the layout of the table). Corner (square): A bet on four numbers at one time. The chip is placed at the intersection of the numbers. Six Line (double street): A bet on six numbers, or two adjoining streets, at the same time. The chip is placed at the intersection of the two streets that are being bet on. Trio/Basket: Both of these bets work on tables with single zero only. In a trio, you bet on the intersecting point between zero, one and two, or zero, two and three. In a basket, you bet on zero, one, two and three simultaneously. Basket (double-zero table only): A bet placed on zero, one and two; zero, double-zero and two; or double-zero, two and three. Top Line (double-zero table only): A bet on zero, double-zero, one, two and three. Table with a Red bet. 1-18 (manque): A bet on the grouping of the lower half of the available numbers above zero. 19-36 (passe): A bet on the grouping of the upper half of the available numbers above zero. Red or black: Probably the most commonly used betting option in roulette – a simple bet on whether a black or red number will come up. Even or Odd: Much like the black or red option, it’s a bet on either an even or an odd number landing. Dozen Bets: A bet on either the first 12, second 12 or third 12 numbers. Column/Snake Bets: Some casinos don’t allow these bets, but they offer odds that are neither better nor worse than any other roulette wager. A column bet covers all 12 numbers on any of the three vertical betting lines, and a snake bet covers a specific set of 12 numbers – 1, 5, 9, 12, 14, 16, 19, 23, 27, 30, 32, and 34. Now that you know all of the different bet types in roulette, it’s time to look at the odds for each significant option. Remember, the odds in roulette are skewed differently than you might think, as are the payouts. With the 36 numbers and two zero spaces, there are 38 total possibilities, but payouts don’t count those zero options, so the house pays you 35:1 when you actually hit. That advantage is what makes roulette such a profitable proposition for the house. Working from that total of 38, if you choose to place a single bet on just one number at a time your chances of hitting are approximately 0.0263 percent. Obviously, it’s not the most advantageous bet in the casino. The split bet, covering two numbers, has 18:1 odds of hitting and pays 17:1. The same odds apply to the “row 00” bet, which covers both zero numbers. Table with a Basket bet and a Street bet. The basket and street bets, which cover three numbers simultaneously have 11.66667 odds against hitting and a payout of 11:1. The corner bet, covering four numbers, has an 8.5:1 chance of hitting and pays 8:1. A top line bet (zero, double-zero, one, two and three) has a 6.6:1 chance of winning and a payout of 6:1. The six line option has slightly better odds than that, coming in at 5.33:1 and paying the winner 5:1. Betting any of the three columns or any of the three dozens offers 2.167:1 odds of hitting a winner and pays that winner at a 2:1 rate. And any of the six betting options that cover half the board (excluding the zero spaces), which include red, black, odds, evens, first 18 and second 18, all have a 1.111:1 chance of hitting and pay 1:1 when they do. The house gets its advantage from those two green zero pockets, making roulette nearly impossible to beat over the course of time. But it can be a fun experience and a way to realize huge profits relatively quickly. It also offers bettors the chance, if they moderate their betting, to be able to stick around the table for a while, extending their gambling enjoyment. © 2012, Big Fish Games, Inc.